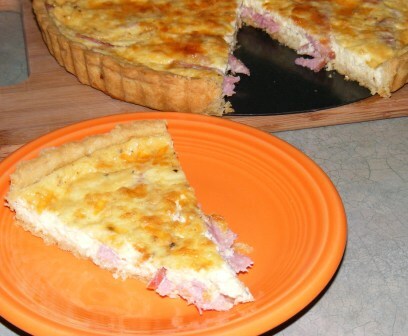 The first recipe I made from the Savory Tarts & Pies section in The Modern Baker was the Ham & Egg Tart on page 136. This recipe couldn’t be any easier. The ingredients list consists of ham (turkey ham, in my case), milk, cream, eggs, salt, pepper, and nutmeg. 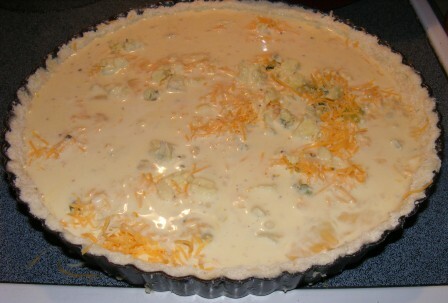 I also followed one of the suggested variations of the recipe and added Gouda. 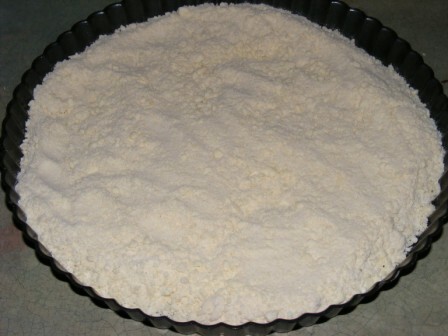 As with all recipes in this section, this one began with the formation of a tart crust. I made the Rich Pie Dough on page 128. 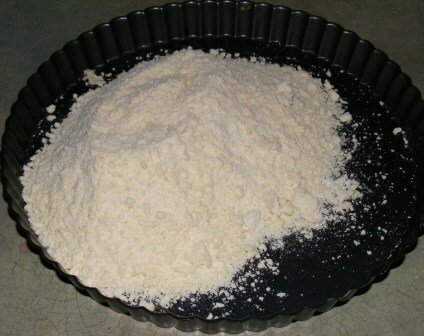 After mixing the dough, I patted it out into a circle. 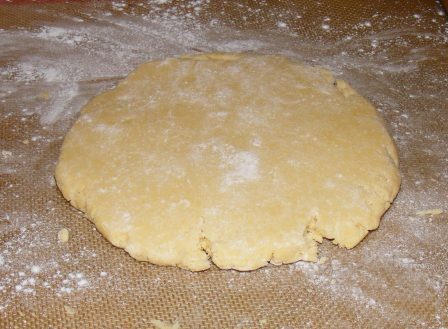 I rolled the dough into a circle about three inches larger than the pan, then transferred it to the tart pan and pressed it into place. As you can see from the picture above, my dough rolling skills aren’t quite up to pastry chef level yet. 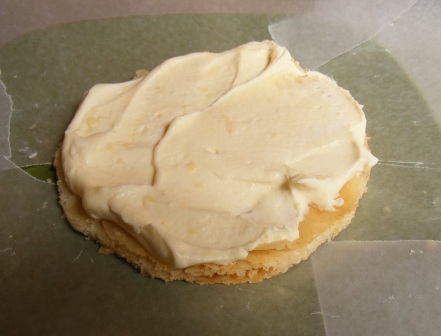 But I’m hopeful that as I bake my way through the next few sections, I’ll develop mad dough skills. Stay tuned and see. 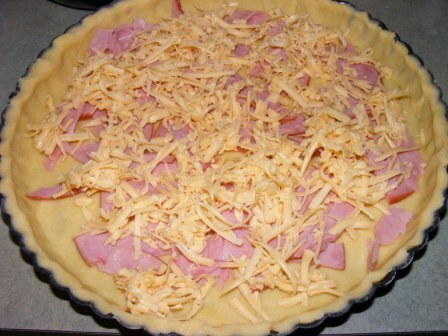 Once the dough was ready, I scattered the ham into the pan, then topped it with cheese. 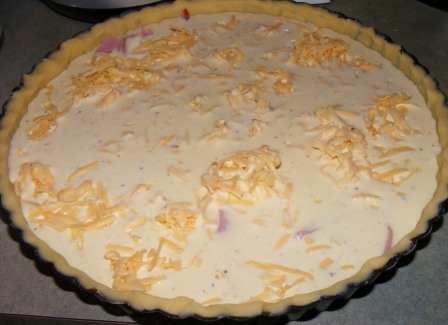 Then I mixed up the custard and poured it over the ham and cheese. 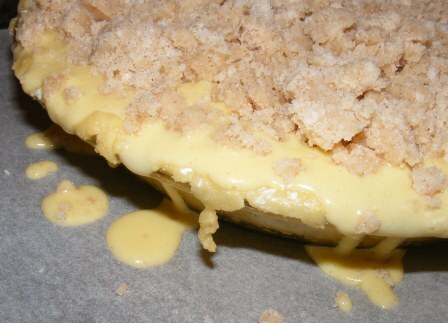 I baked the tart in a 375°F oven for 30 minutes, until the custard was set and puffed. 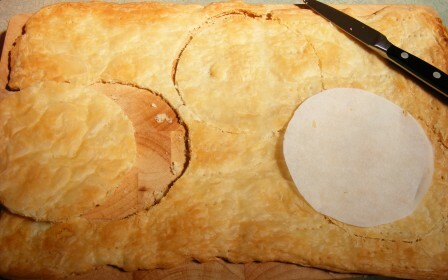 I cooled the tart in the pan for a few minutes, then removed it to a serving platter. I served the tart for a light lunch. It was savory and delicious, and reminded me of the ham and cheese breakfast bake my mom used to make when we were growing up. As often happens around the holidays, I’ve found myself a little bit sweeted out lately. So I’ve been looking forward to this new section, where all the recipes are savory. 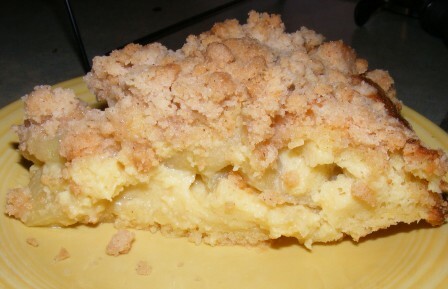 And if this tart is any indication, I’m going to enjoy the next few months immensely. 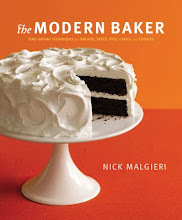 The first recipe I claimed for the Savory Tarts & Pies section of the Modern Baker Challenge was one that Nick Malgieri claims he could “bake and eat… once a week”. Having made it myself, I can see why. This recipe is quick and easy to throw together, and what little effort it required was well worth it. 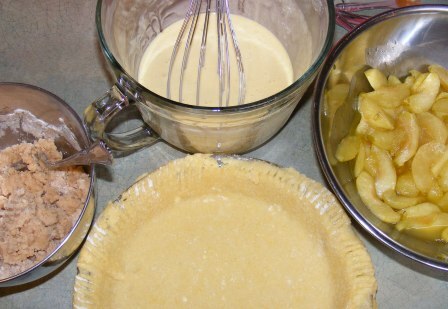 I started by making the tart crust. 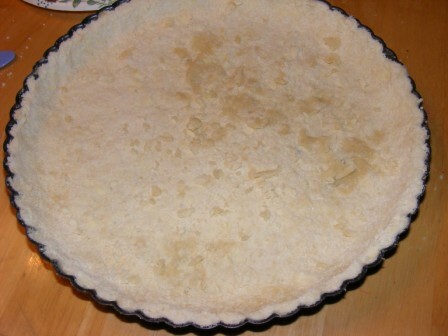 Nick gives three recipes for tart dough in this section — Rich Pie Dough for Savory Pies and Tarts; Olive Oil Dough for Savory Pies and Tarts; and No-Roll Flaky Dough. He suggests either the rich or no-roll dough for this recipe. I’ve made the rich dough several times and am actually getting pretty good at it, so I decided to try the no-roll dough for this recipe. With my dough made and in the pan, most of the work was done. 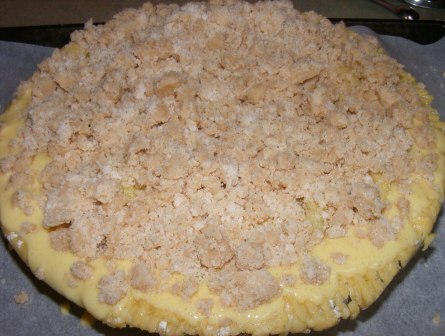 The tart filling begins with walnuts toasted for a few minutes in a pan, then set aside too cool. 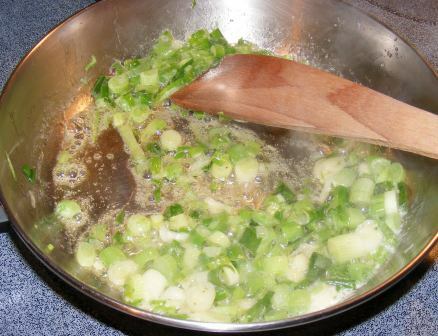 Next, I sautéed scallions in butter for a few minutes, until they were soft and brightly colored. After letting the scallions cool for a few minutes, I scattered them over the crust in the pan, then sprinkled on the cheese. 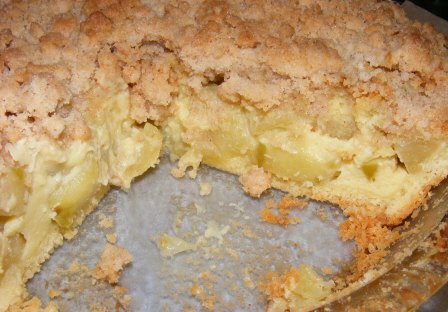 I mixed up the custard, which consisted of milk, cream, eggs, salt, pepper, and nutmeg and poured the whole thing into the crust. 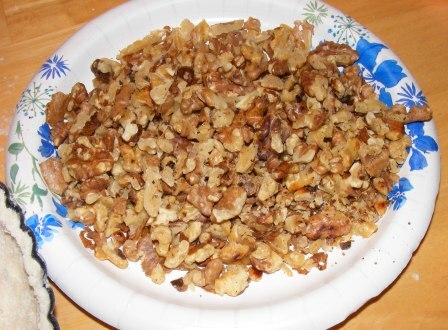 Fortunately, the tart had only been in the oven for a few minutes at the time, so I pulled it back out and scattered on the walnuts. 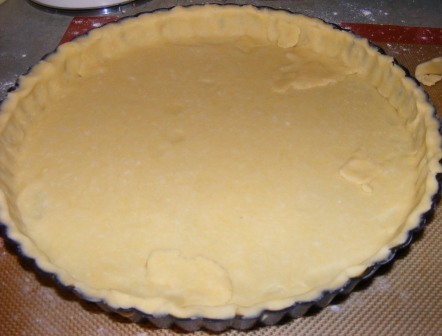 Back in the oven, the tart baked for about 30 minutes, until the custard was puffed and lightly browned. I cooled the tart in the pan for about five minutes, then removed it to a serving plate. 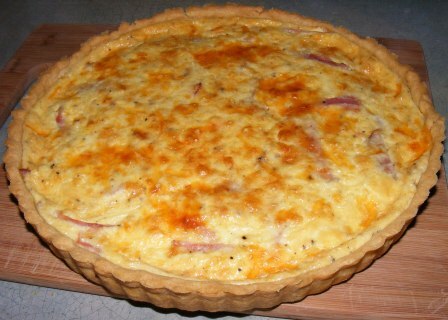 I served the tart for a light weekend supper. 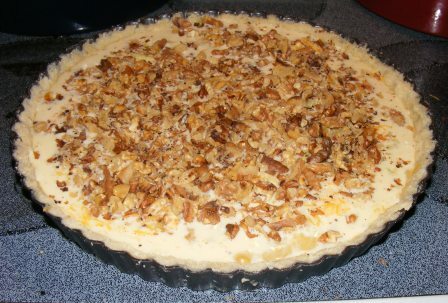 I didn’t measure the walnuts, and I think I might have used too many, as they somewhat overpowered the other flavors in the tart. 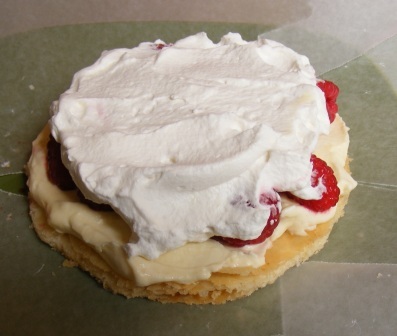 Even so, this tart was absolutely delicious. 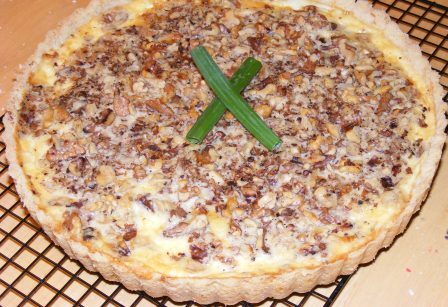 The scallions, cheese, and nuts all complimented each other well, and I found myself going back for small slices throughout the evening. I can see why Nick is so fond of this recipe. 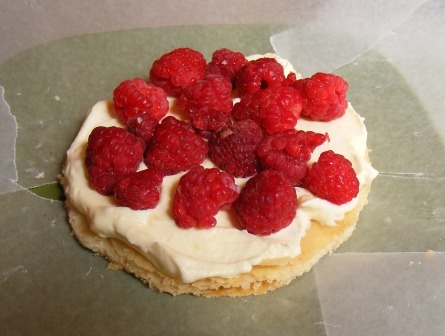 And while I may not make this tart once a week, it will certainly be featured on my table on a regular basis. I have to put this out front: I don’t like semolina. It’s fine in pasta, and I grew up eating — and still enjoy — Cream of Wheat. But I have yet to find a bread recipe made with it that I like. And believe me, I’ve tried. And tried. Not surprisingly, I didn’t vote for this recipe. In fact, I’d have voted for just about any recipe in the book over this one. But the majority spoke, so I would bake. Two things about this recipe gave me a small glimmer of hope. 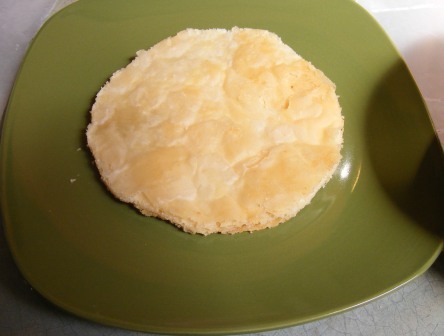 First, it was made with Cream of Wheat rather than straight semolina flour. 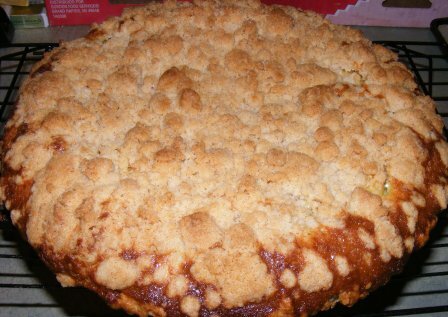 That may not sound like much of a difference, but as I said, I like the cereal, so I hoped the finished product might be more akin to it than to the semolina breads I’ve made. 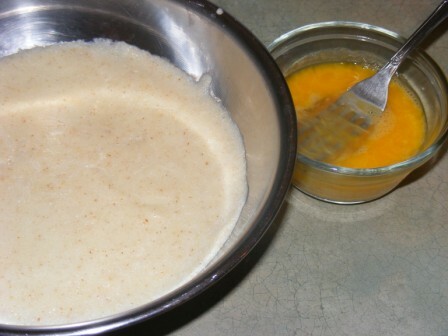 In any case, I hadn’t had Cream of Wheat in a while, and making this recipe prompted me to go out and buy a fresh box. 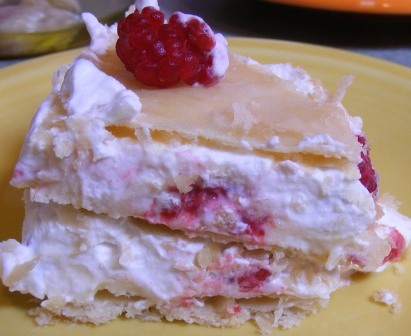 The other thing about this recipe that encouraged me to try it is that it is a dessert. 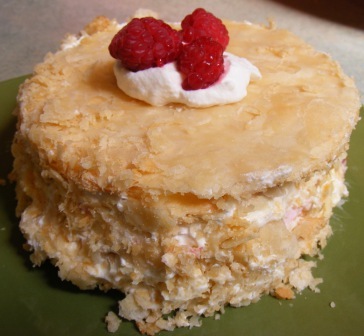 I’ve rarely met a cake I don’t like, so I was willing to give this one a go. And the promise of caramel didn’t hurt matters, either. The recipe itself is quite simple. You cook the Cream of Wheat, then add sugar and vanilla. After stirring the sugar and vanilla into the cereal, I was tempted to just give up on the recipe and eat the Cream of Wheat. It was really good, especially while it was still hot. 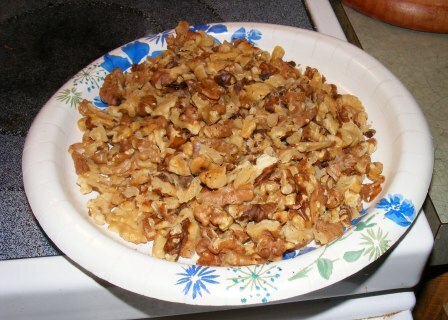 While the cereal mixture was cooling, I made the caramel sauce, which consisted of sugar, water, and lemon juice. 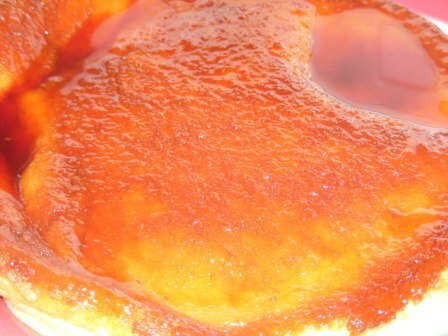 The mixture is boiled and then allowed to keep cooking until it takes on an amber color. 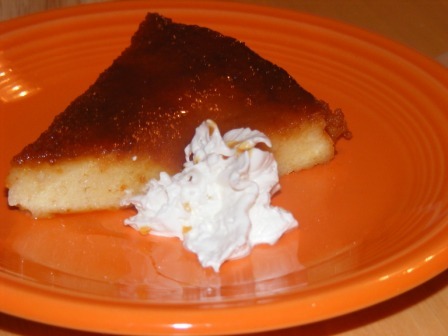 If you make this recipe, be aware that, because it is such a small amount of sugar syrup, it will go from light to amber to burnt really quickly. My caramel had a nice amber color, and it wasn’t until the cake was in the oven and the caramel pan had cooled to the point that I could sample it that I realized my caramel had overcooked and become slightly bitter. 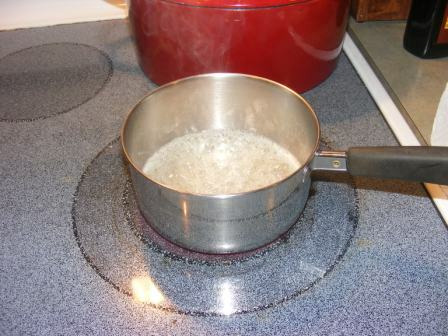 After pouring the caramel into a preheated cake pan, the final step was to mix eggs and golden raisins into the cereal mixture, then put the mixture into the pan on top of the caramel. 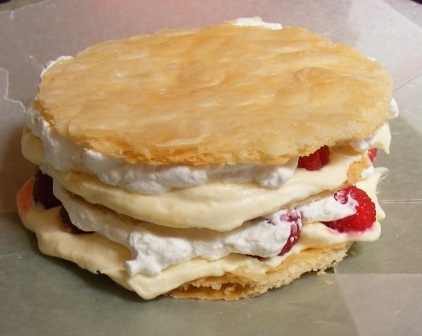 The cake bakes for about 30 minutes in a 350° oven, until it is puffed up and firm. 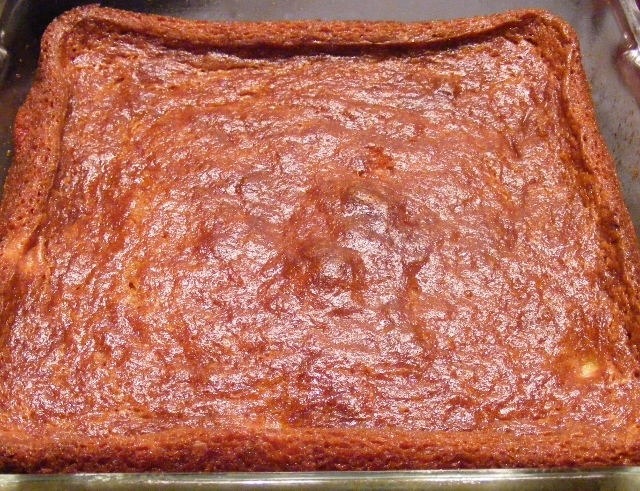 I let the cake cool in the pan for a few minutes, then turned it out onto a serving plate. The caramel pooled on top of the cake, and the whole thing smelled really good. I began to think my reservations had been unfounded. 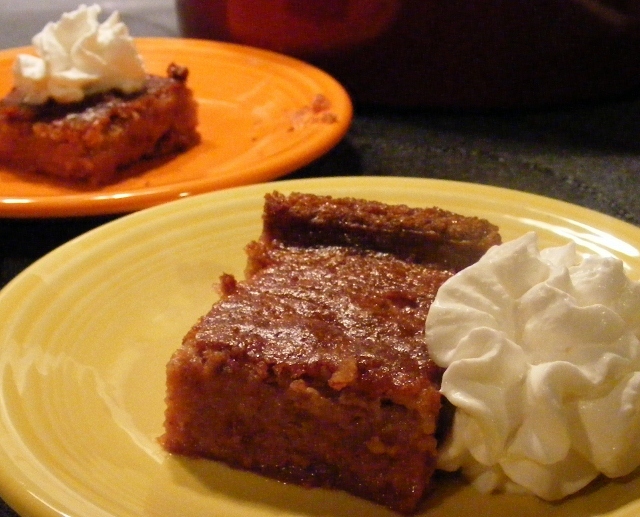 I allowed the cake to cool to room temperature, then sliced it, spooning some caramel onto each slice. We had the cake for dessert after dinner, and everyone seemed to enjoy it. No one complained about the burnt caramel, although I found it quite bitter. 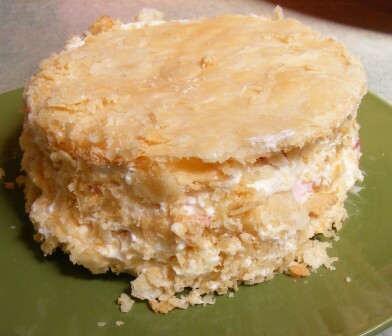 And the cake itself didn’t do much for me, either. It tasted like Cream of Wheat that had been allowed to firm up. So I guess I’m still batting .000 when it comes to semolina recipes. But I’m not sorry I tried it. And at least I have a fresh box of Cream of Wheat to enjoy as the weather gets colder. It happens every Fall. I get on a pumpkin kick. Actually, I love pumpkin enough that I cook and bake with it year-round. But there’s something about the weather changing around this time of year that always sends me to the store to stock up on canned pumpkin and has me scouring the Internet and my cookbooks for untried pumpkin recipes. So, when I got my copy of Around My French Table, it was only natural that I turned to the Index and started looking at the pumpkin recipes. This recipe caught my eye right away. And I knew I couldn’t wait for French Fridays with Dorie to make it. 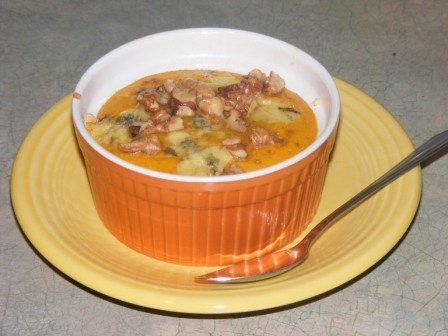 So on a recent weekday evening, we had Pumpkin-Gorgonzola Flans for dinner. This recipe is easy enough to whip up after work. 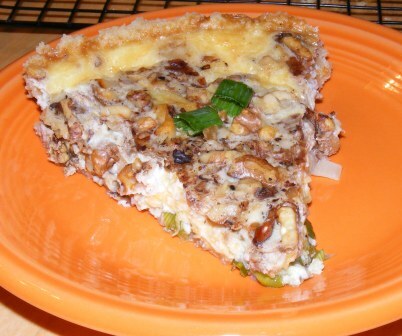 The ingredients consist of pumpkin, eggs, heavy cream, salt, pepper, gorgonzola, and walnuts. 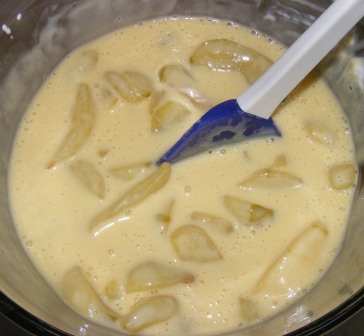 You mix the first three ingredients in the food processor, season with salt and pepper, then pour the mixture into buttered custard dishes. 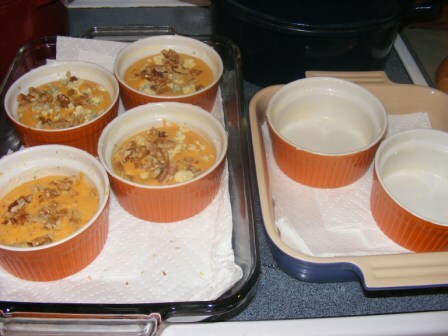 The recipe says that it makes six flans, and Dorie writes that she uses 6-ounce custard cups. 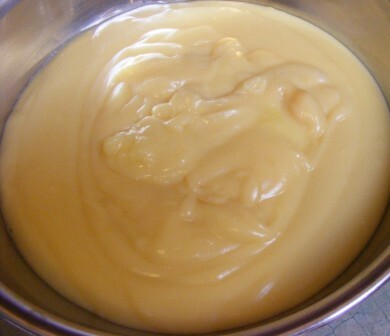 My cups are also six ounces, but, as you can see, the custard mixture only filled four of them. I’m not sure why my results differed from the recipe. Another difficulty I had with the recipe, besides the custard cup issue, was trying to balance the salt. 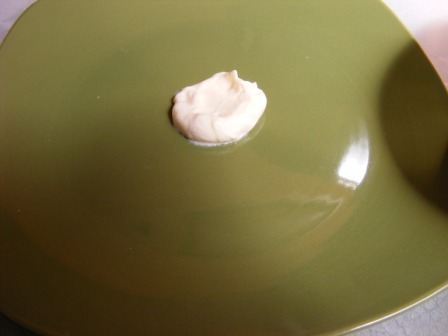 After adding salt and pepper to the custard, I tasted it, added a bit more salt, and tasted again. It still seemed to be slightly under-salted, but I knew the gorgonzola would be salty, and I didn’t want to overdo it. 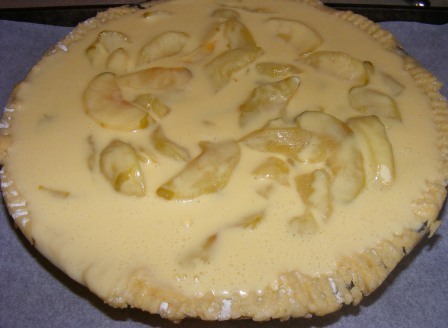 I did sprinkle the flans with fleur de sel before putting them in the oven, both for appearance and for that final burst of flavor. 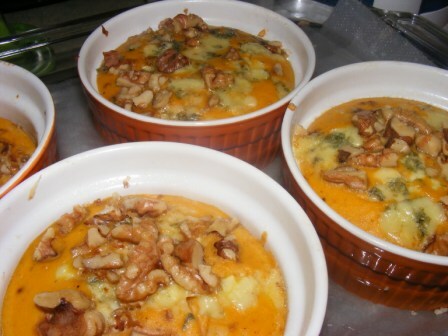 After filling the cups and adding the gorgonzola and walnuts, I baked the flans in a water bath for 35 minutes, until the custard was set and the cheese melted and bubbly. Next came the nearly impossible task of waiting for the flans to come to just-warm temperature before eating them. I drizzled the tops with a touch of honey before serving. My wife, who is not a big fan of French cooking (at least not yet, but I’m working on it), initially said she didn’t want a flan, but wanted to take a taste of mine. One taste was all it took, and she was hooked. Even though she had just had a few pieces of pizza, she ate her flan and declared it one of the best things she had ever tasted. And I would have to agree. 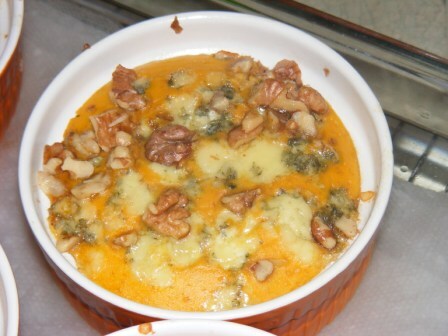 The mild flavor of the pumpkin custard paired perfectly with the tang of the gorgonzola and the slightly sweet finish of the walnuts. The salt level was perfect, and I was glad I had given it that final sprinkle of fleur de sel. 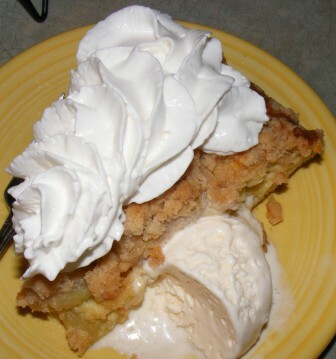 This is another winning recipe from Dorie’s new book. 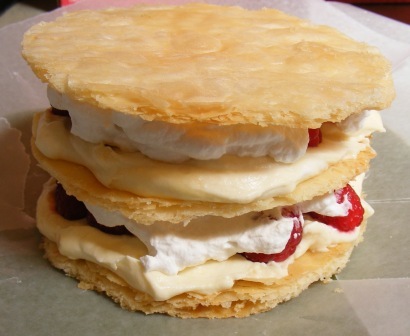 And I’m one step closer to making a French food lover out of my wife.